Each year CIFE award prizes to the very best students in its member colleges and we’re delighted to announce that Brooke House College students won two 2016 awards. Vo Hung Huu won an Andrew Osmond Maths Award, and Dan Ning won a college prize for her outstanding contribution to life at Brooke House College. 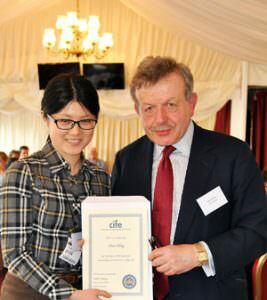 The students received their prizes from CIFE President Lord Lexden at a ceremony in the House of Lords. Vo (pictured right with Lord Lexden) is an extremely able, hard-working and academically gifted candidate, who obtained A*, A*, A in Maths, Further Maths and Physics A levels, as well as an AEA Mathematics Distinction. Since coming to the UK, he impressed his teachers not only with his breadth of knowledge but also with his preparedness to ask probing questions about topics under discussion. Vo is a brilliant and studious individual whose high academic ambitions are carefully channelled. His single-minded determination coupled with his intellectual curiosity will set him up to have a successful career in whatever path he chooses. 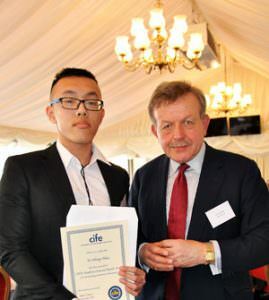 Dan (pictured right receiving her award from Lord Lexden) is an intelligent and extremely hard-working student who since being at the college has excelled and shone. She is strongly motivated to succeed at the highest level, pushing herself to work well above the exam board syllabus. She is a talented Mathematician achieving 100% in four of the A Level examinations, with her lowest unit grade 93%. Dan’s teachers predict her to achieve A*s in all her A level subjects. As a person she relates well to fellow students, helping others in and out of class. She has an engaging personality and warmth which is apparent when meeting her.